This scenario to the end of the pulp tissue also known as the nerve generally occurs when the bacterial invasion is slow. This is modified by person’s immune system and the size of the canals. 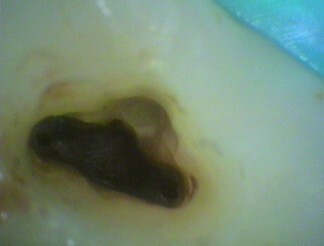 In teeth that have had a history of past decay and fillings the nerve makes more calcified material to protect itself. This means the tube of the nerve gets narrower, so the volume of bacteria entering the canal at once is less than in a younger person with little past history of decay. Instead of an acute infection, where the body struggles to fight the onslaught, the immune system has time to put up a defense. This is called a chronic infection. The body tries to wall of the infection from entering the bone. However, a chronic infection can become an acute if the conditions favour the bacteria greatly. Often we find that there is dead or no tissue in the canals. 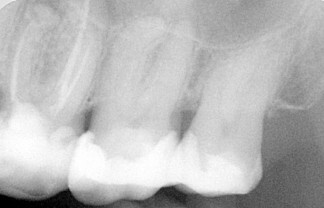 There generally is no bleeding and xrays may show no reaction in the bone. A cold test (-50 degrees C) is used to see how alive a tooth. A good tooth will respond to cold quickly and once the cold is removed the response quickly stops. Also a good tooth is not tender to tapping it. A dying tooth responds with a heightened response and aches for some time after the cold is removed, and is tender to tapping on it. Typically the slow whimper tooth may or may not respond to cold, and maybe be tender to tapping on it. It can be difficult to diagnose. However, often there is a history of an ache to hot. The nerve has died slowly and the tissue is breaking down. This releases gases that when warmed up, can expand and irritate any remaining nerve tissue. Sometimes cold can relieve the pain as the cold contracts the gases. The dentist can even drill into the tooth without the person feeling anything. Occasionally, when the dentist enters the nerve space the gas is released, and briefly, an odour maybe smelt by all. Lovely! The dead (necrotic) is removed and the canal cleaned and dressed. Antibiotics may or may not be needed. The most important step for any root canal is to clean out the decay and seal the tooth from further bacteria getting into the tooth. This usually means removing any old fillings and using material that will seal the tooth ready for further work on the next visit. 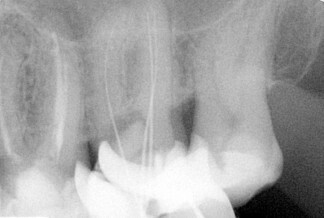 This we will explore in further blogs the process of root canal therapy.